The CB-X comes with an 80s-style plastic belly pan which then as now, just keeps the flies off te engine. Along the right side is a thin, stainless cat guard but none of this will protect the pipes or the sump from a heavy dump onto a rock or from flying debris. 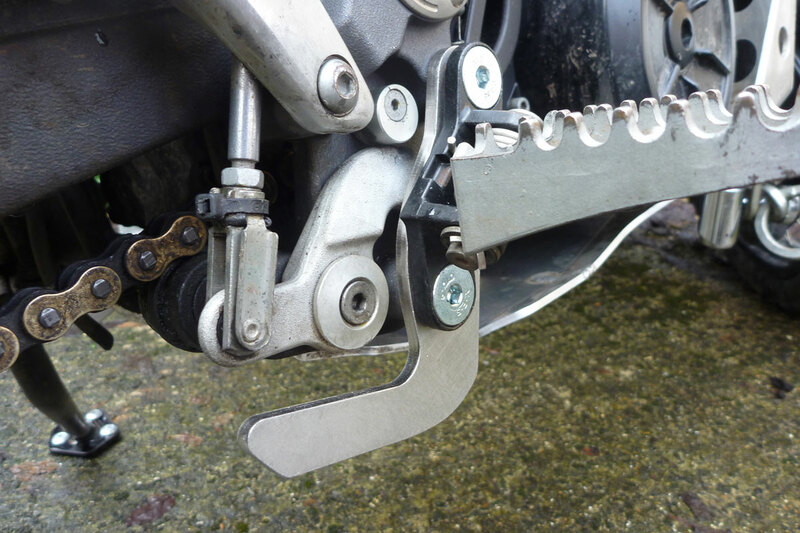 The Rally Raid bashplate crashbar cost a hefty £238 but is more than just a few slices of alloy bent, cut and welded into a protective clam shape. The CB-X is a bit different from a typical single cylinder trail bike in that the pipe goes under the motor. 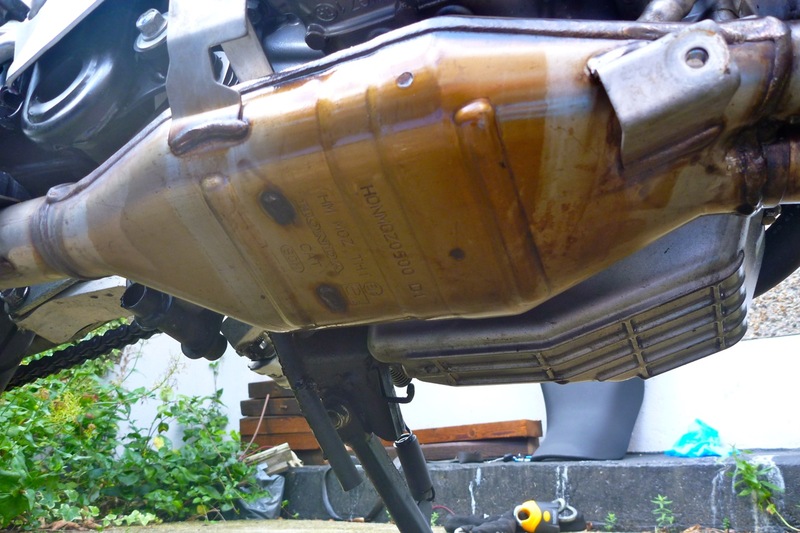 The slim cat is actually neatly integrated in the headers which tuck in alongside the sump (right) so cleverly, no extra depth is added unlike my last two ‘under pipe’ bikes. But the oil filter sticks out the front and the engine cases are vulnerable and so proper protection is needed all around. I didn’t look for alternatives but they are a couple out there (left) – both at around £100 but in relatively flimsy 3mm alloy and both retaining rather than replacing the thin stainless cat guard. 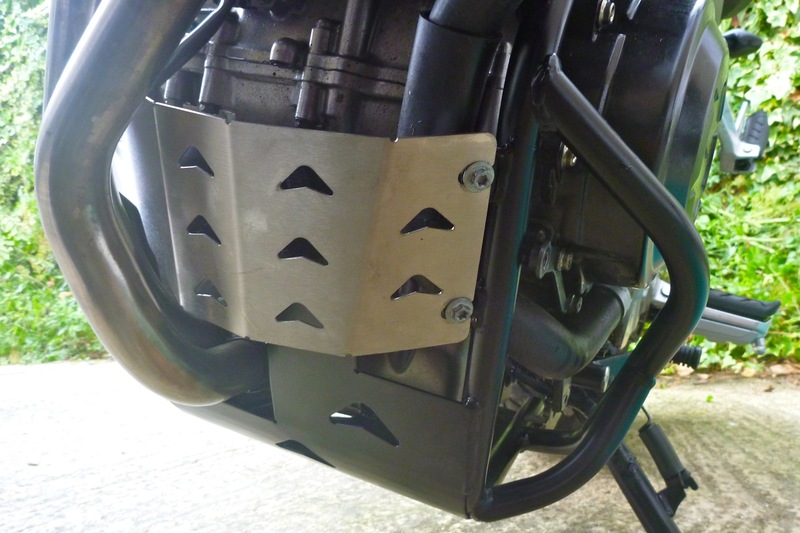 SW Motech do make lower engine bars and upper tank guards at about €100 each, but it’s unclear whether their sump guard and the crash bar are compatible – it looks like it could be one of the other. 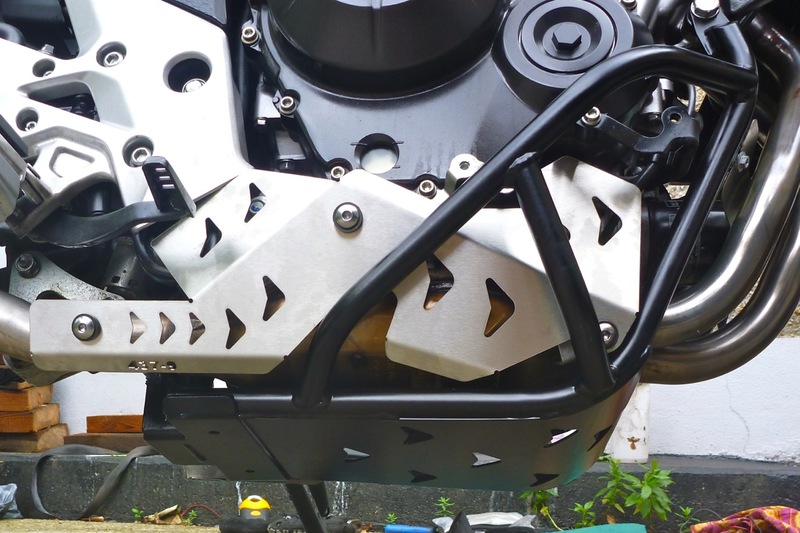 With the Rally Raid unit the steel crash bars are integrated with the steel underplate and the whole thing weighs 3.4kg. 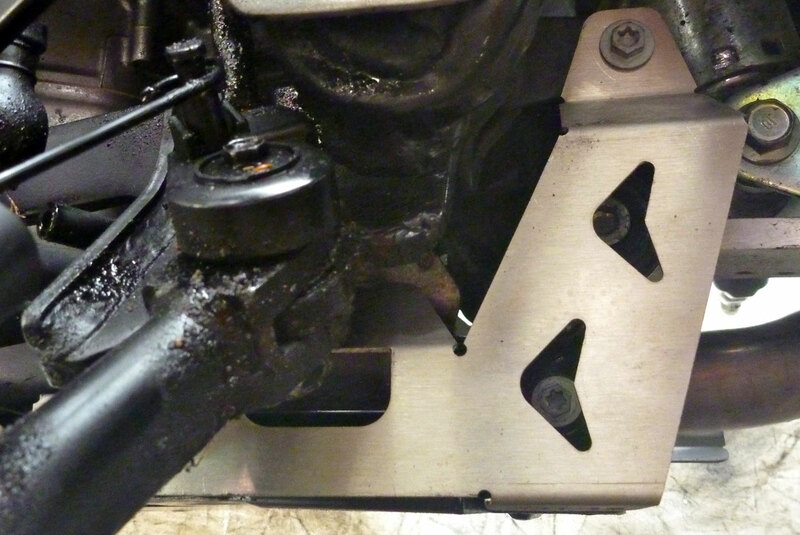 Separate thin stainless panels are added behind the frame over the cat, across the front of the oil filter (right), and underneath the shifter on the left. 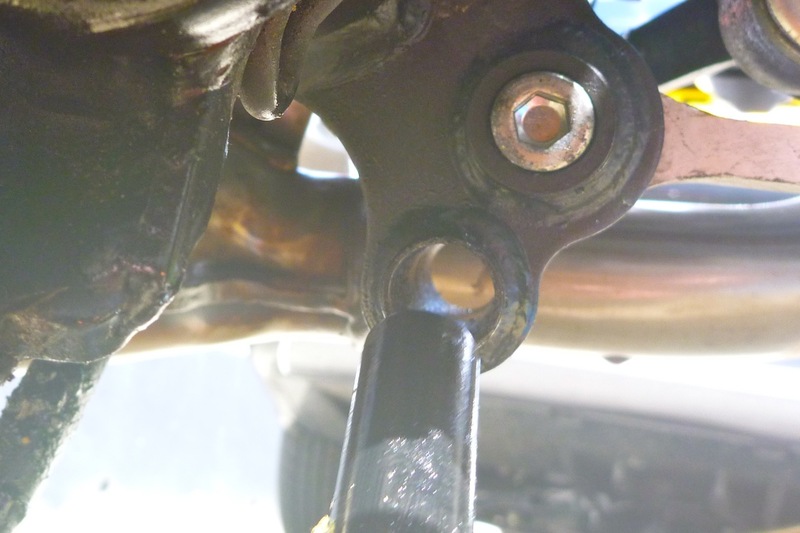 After removing the bellypan and cat cover, fitting started by slotting a pin to mount the back of the plate on the unused centre stand pivot tube. The powder-coated RRP pin felt just half a mil too thick, actually because a bit of rust has developed inside the centre stand pivot tube (left). Once that was scrapped out with a hacksaw blade it fitted in with some hammer aid, but even with a good greasing I get the feeling that pin may be in there for good. 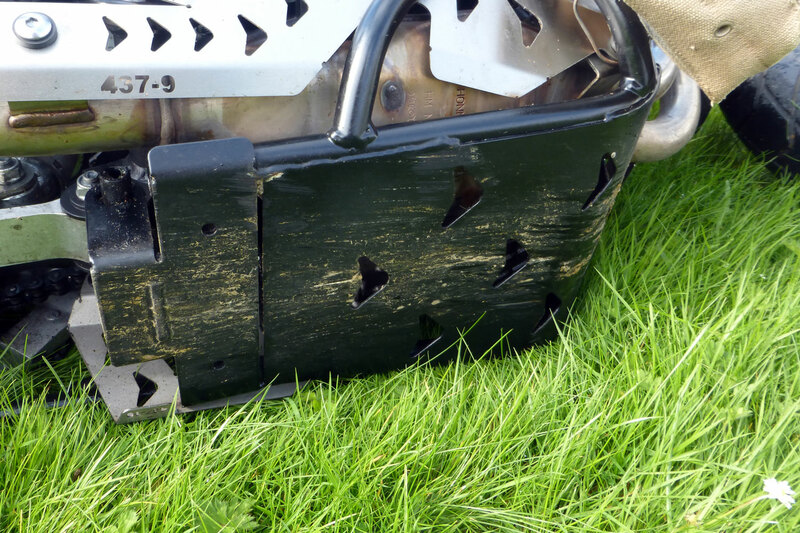 The RHS stainless cat cover (left) lined up just right – 10/10 for bend and cut – and the steel plate was ready to swing up into place to be bolted in place with the replacement front engine mounting bolts supplied. RHS bolt went in OK but on the left it was 5mm ahead (above right). 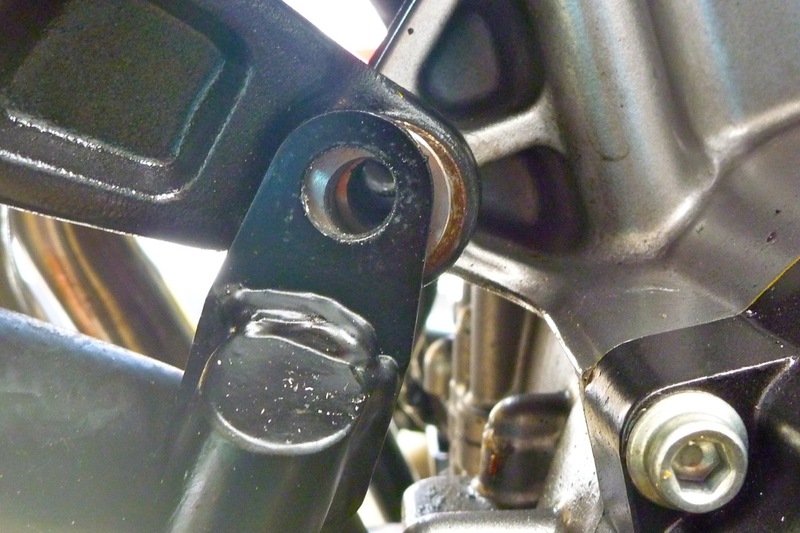 Seems ‘they all do that, Sir‘ and some tactical levering with a hammer handle sorted the alignment to get the bolt in without cross-threading the engine’s alloy which would be deeply vexatious. I’m not quite sure what the separate plate behind the side stand is protecting (left). Something to do with the shifter linkage? 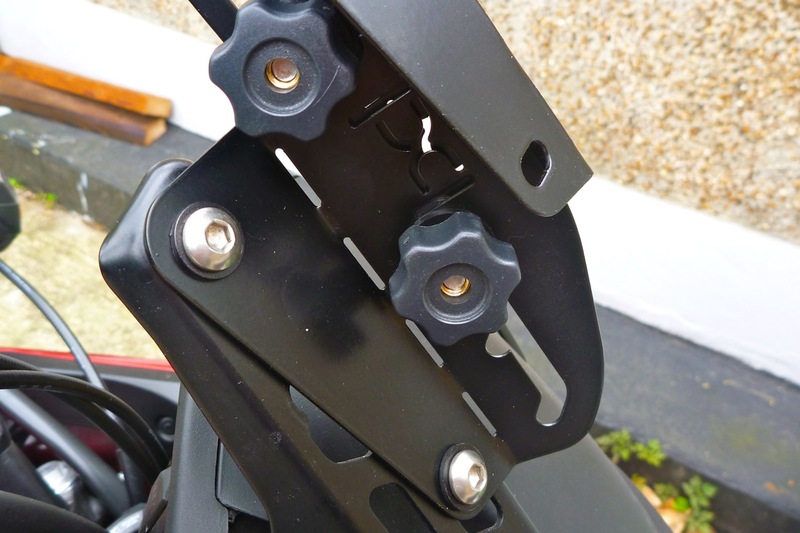 That’s reasonably well protected by the side stand mount and held on with a single bolt the plate looks a bit flimsy to do anything substantial, assuming it’s trying to be similar to plates which Erik Bok makes for X bikes (right). All up that took about an hour, plus another hour of going back and forth to the house to get extra bits and pieces, but I’m confident that any rock that dares to intimidate the steel base of this plate will end up with quite a headache. I did a 100-mile run and was pleased to noticed no resonance as you can get with some slabby bashplates, and the handy bars mean I can attach my ‘signature’ ammo pouch. My bike came with no tools, even though the (used) test bike I rode in January had a set under the seat. Odd thing is they’re not even appearing on ebay or listed anywhere and word is some CB-X markets get them and some get nothing more than a hex key with which to pick your nose. Not even a C-spanner for the shock. It’s a bit like a car not coming with a jack. I know we know OE Jap tools aren’t exactly Snap-On Platinum Line but you do wonder if there’s some autistic bean-counter at Honda who isn’t able to fully appreciate the ill-will caused by absent tools with the tiny cost of sticking some under the seat. But we’ve been hearing this ‘spoil for a hap’orth of tar…’ business for years. 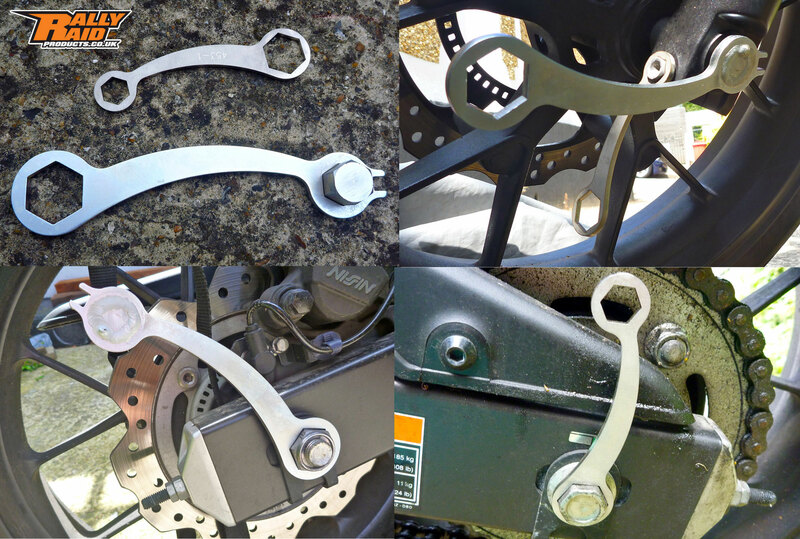 Rally Raid’s hard-working laser cutter to the rescue: two double-ended ring spanners in 2mm zinc coated steel (left) to cover all fittings for front and rear wheels and even a spoke key for the optinal wire wheel. 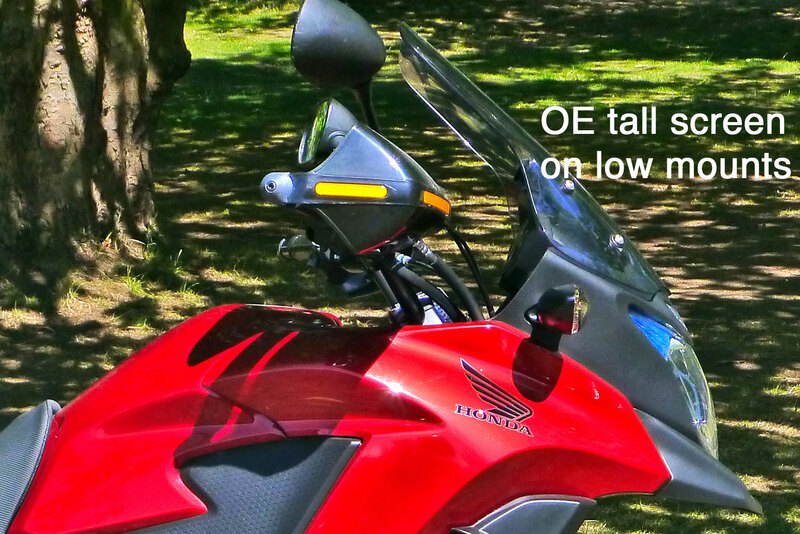 On the CB500X forum there’s a l o n g thread on screen options, and one thing you’ll soon learn is that what’s sauce for the goose is something else entirely for the gander. Some riders say stock is best, others find an aftermarket screen to be perfect/terrible and others even claim the bike is best with no screen at all. Well that just about covers it all then. 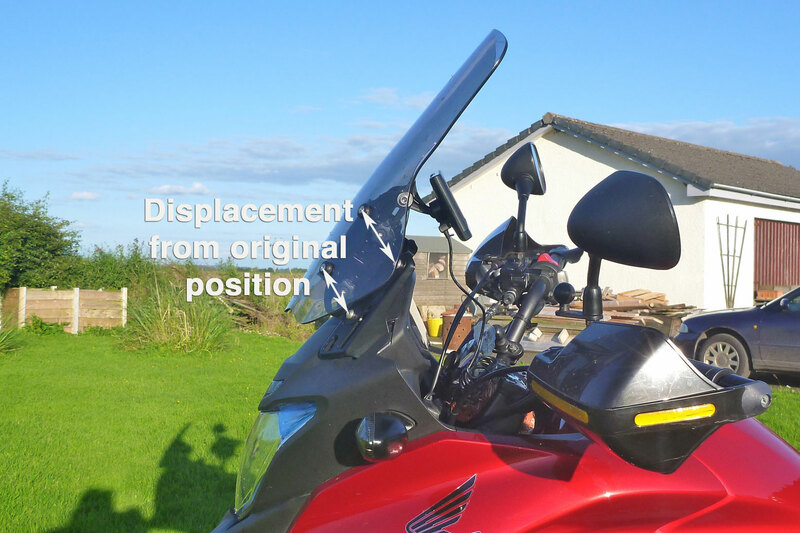 My bike came with a taller Honda screen installed which at 17 high x 15″ wide (curved) is OK but leans too far back (right). 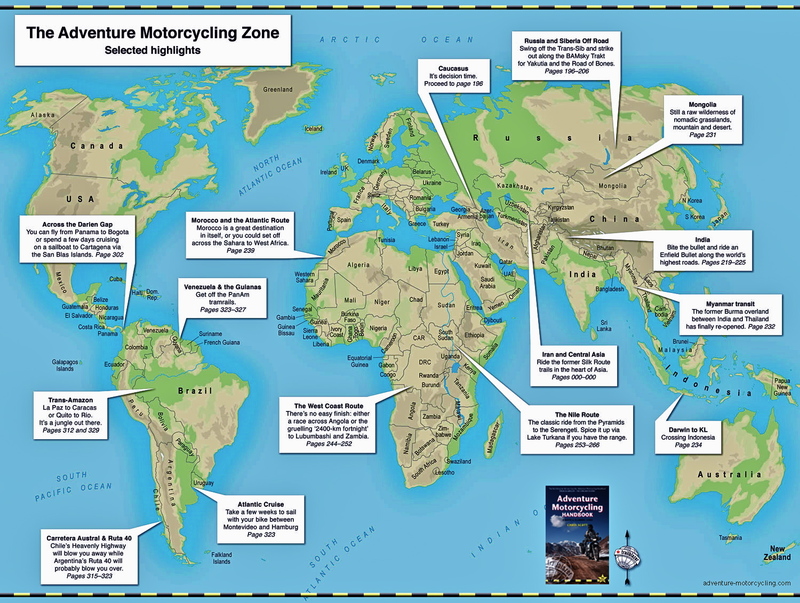 I can feel the air hitting the top 4 inches of my lid but I can’t say it’s unbearable buffeting or especially noisy: let’s face it, I’m riding a motorbike not reposing in the back of a stretch limo listening to the Chemical Brothers. The bloke of the woman who sold me the CB-X suggested spacing the top mounts out by an inch or so to set the screen more vertically. It’s the sort of bodge I’d do without thinking on an old hack, but let’s try and keep this relatively new Honda looking proper for a while. After reading that thread it seems to me that screen adjustability is the key if the goose and the gander are to be accommodated. 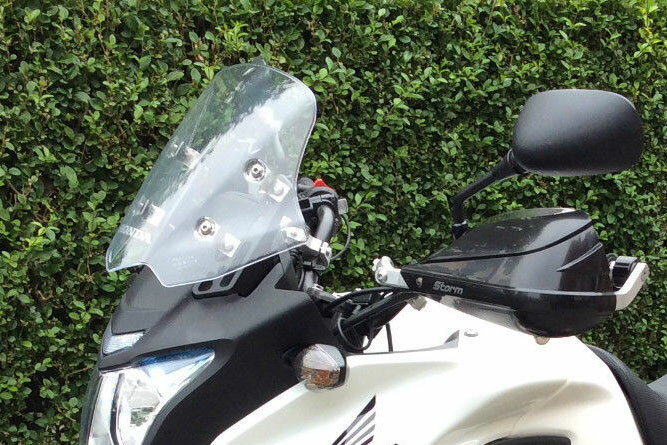 There’s much more choice out there for CB-X windscreens than bashplates, from the likes of Givi, Puig, MRA, Madstad and others, some of them with fully adjustable mounting brackets. 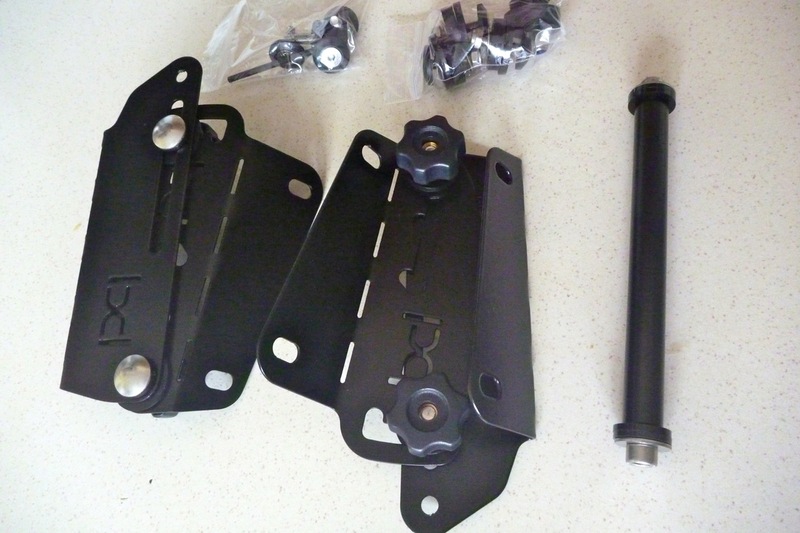 But because my screen is tall enough just at a bad angle, I figured all I needed was a repositioning frame and the thread mentioned just such a thing: an adapter kit by Palmer Products who make them for all sorts of bikes, and other stuff besides. Never heard of Palmer until now but their adapter fits between the OE screen and the fairing mounts to give three heights and three angles. Added to the Honda’s high or low position, that’s 18 possible positions. 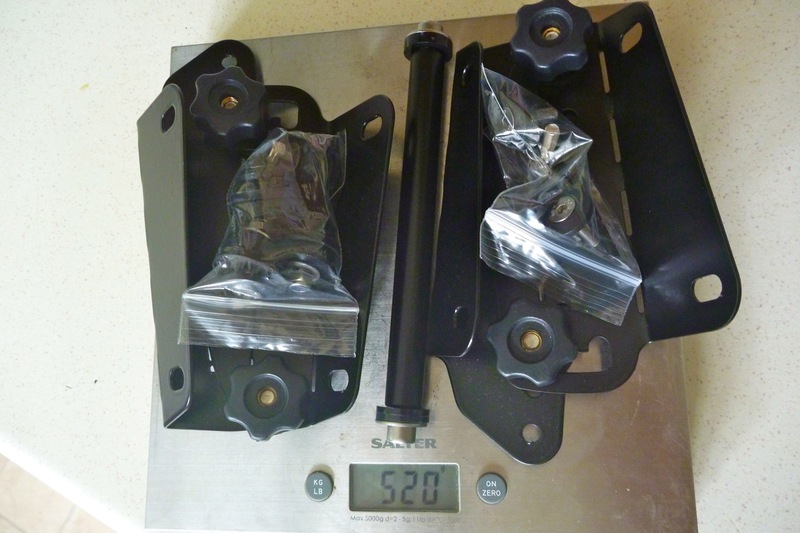 The full kit weighs 520g. 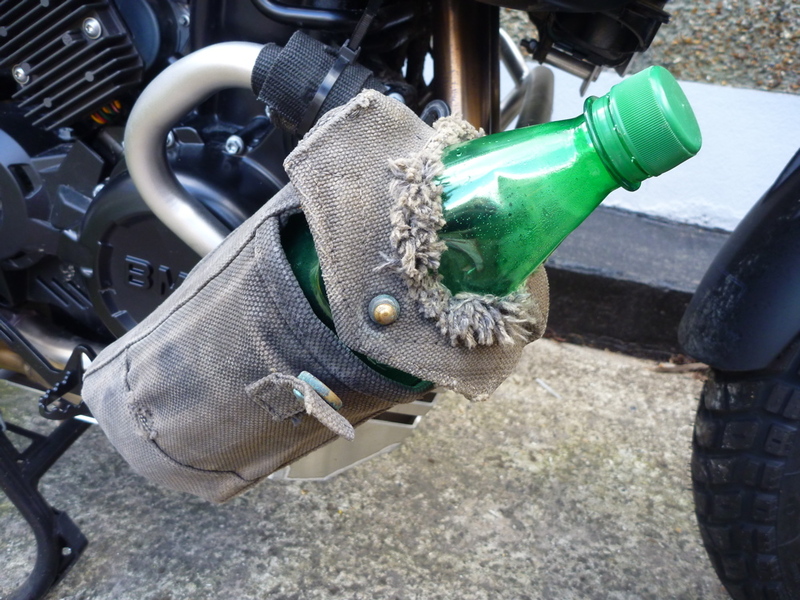 It took only 20 minutes to fit, reusing some of the Honda bolts despite a full set of fittings supplied. I paid extra for the knobs option to be able to adjust without tools, and in black rather than bare steel to perhaps make it less obtrusive on the move. With an accessory bar (not fitted yet), that came to £116, quite a lot but all nicely powder coated, well made and fitting right. In the end I set mine up on the higher Honda level and then height 2/3 on the Palmer and 3/3 fully forward. 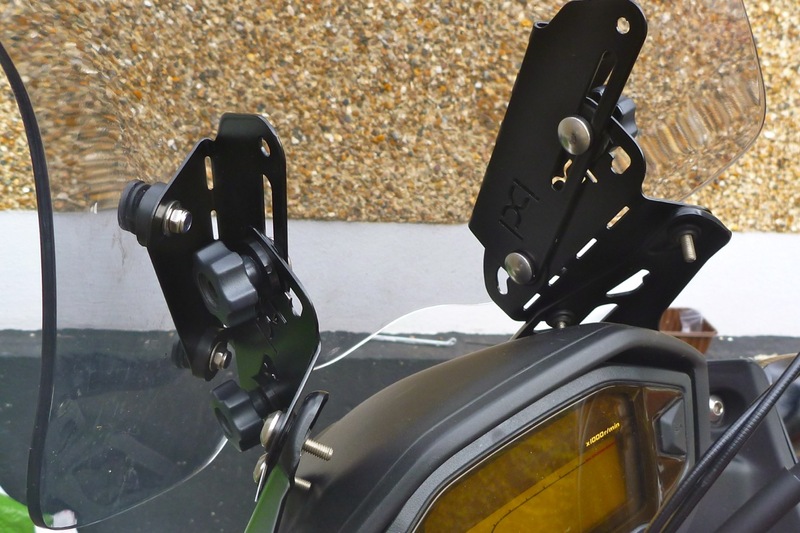 The Palmer system looks broadly similar to a Madstad I saw recently at an overland show (right – a bar-mounted kit; they do CB-X too, see link below), but has indexing notches to give the three height and forward positions (though I suppose you could position between notches if you wanted). As it is with a US-made Madstad you have to buy their screen, costing over £200 although the few comments I’ve read not surprisingly rave about it because of the fine tuning. 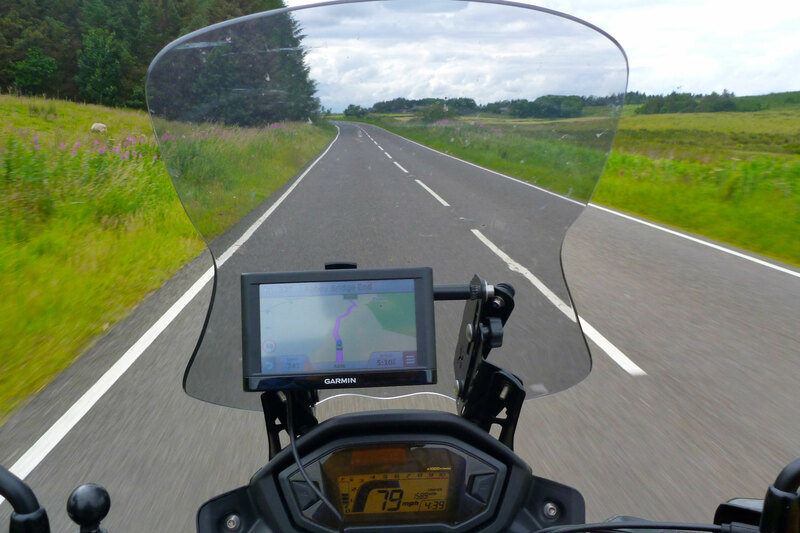 I’m off on a long ride to far north Scotland next week and hope that before I arrive I’ll also have found an optimal position for the PP adjusted screen. More news about how it fared later. Other bits lying in wait for the CB-X include a pair of fat Renthals to go with the RRP triple clamp when that gets in, and some RRP fat pegs which they kindly chucked in with the plate after John put me off some Pivot Pegz I was going to try off Adventure Spec. 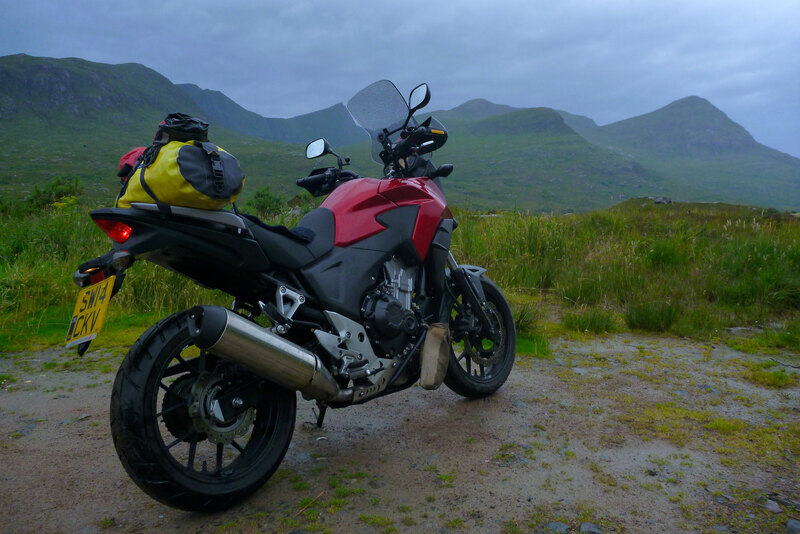 Right now I’m still enjoying the Honda’s non-pivoting rubber-capped units but in the dirt they say wide platform pegs are the way to go and as part of my mission is to try new stuff, new stuff I shall try. Even before I got to the end of Park Lane (a rare 40mph road in London) I could tell the Palmer wasn’t going to transform my ride to like sitting in the back of a stretched limo. Later, out on the A1 it didn’t feel much of an improvement, but as the OE screen wasn’t bad, this wasn’t bad either. Good impressions (or indeed a comparison) weren’t helped by the fact that I was now wearing my cheaper, noisier and more rattly Bell Moto 9 lid and not my X-Lite. And I keep forgetting to use earplugs. At one point in the journey I moved it from Palmer height 2/3 and 3/3 fully forward to ⅔ and 2/3 – in other words angled a little more back. Well that didn’t make things worse so I’ve left it at that. 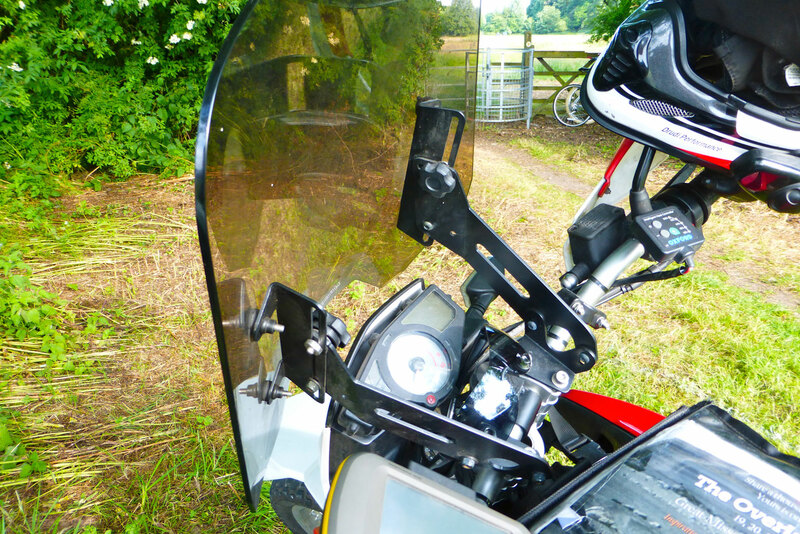 The screen catches most bugs but a few still get to the visor – same with rain drops so the visor’s not out of the airflow which you’d think is the point. And the screen feels far forward for it’s slim width. The arms and shoulders catch some blast but, as has been said, I am on a motorbike. Later I noticed that over 70mph the flow does go right over which would suggest re-steepening the angle to 3/3 to make it do the same as slower speeds. 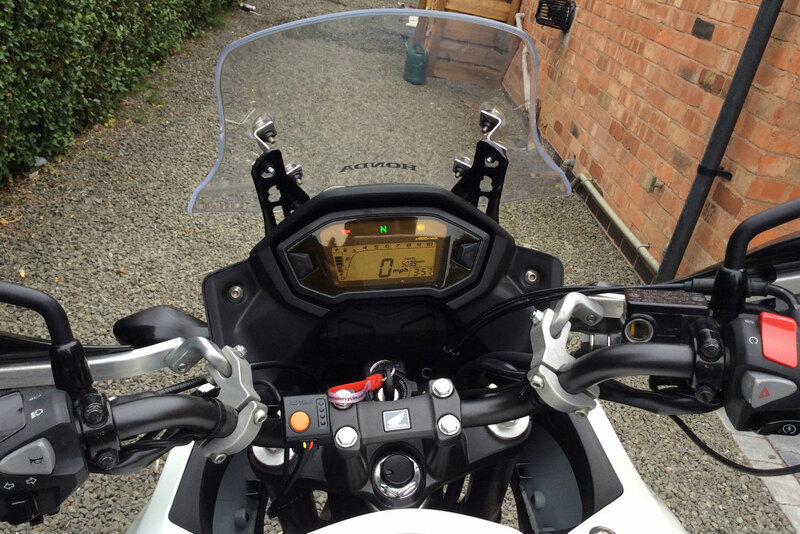 Interestingly, a quick scan on ebay found a CB-X for sale and though he doesn’t mention it, at some point in 5000 miles of commuting he added some crude angle brackets to space his short OE screen forward an inch and at the same time raising the height a bit. So there must be something to it. More experimentation is required with the Palmer, or just accepting I’m on a bike and remember the earplugs to retain what’s left of my hearing. Other observations: helped a little by an Aero wool pad, the seat actually supported a 520-mile day. While doing 70mph where possible and down to 50 in traffic, the mpg was 80, with the odometre some 3.2% over (measured against roadside PKs (right) over 20km. 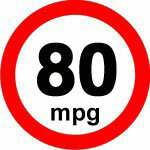 So that’s a true 78mpg. And all in all, a great machine that’s about to get even great-er. 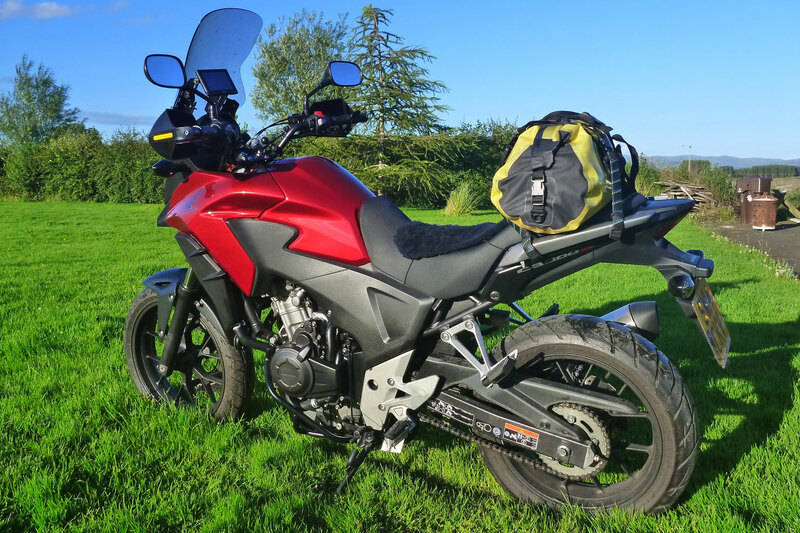 This entry was posted in Adventure Motorcycling Gear Reviews, AMH News, Project Bikes, Project: Honda CB500X Rally Raid and tagged CB500X skid plate, CB500X sump guard, CB500X windscreen adapter, CB500X windshield, Palmer PRoducts windscreen adapter, Rally Raid Products bash plate. Bookmark the permalink.